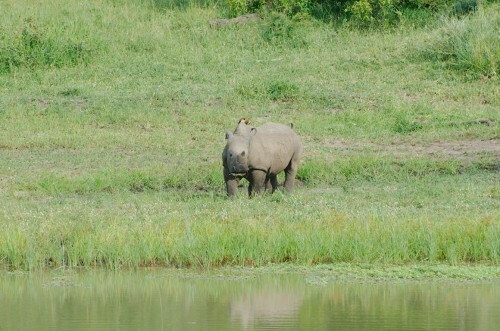 Tectonic Pate » One less black rhino? Mid-summer (ie. 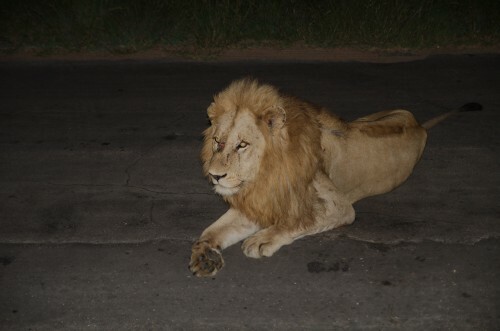 Christmas) is not the best time to visit the Kruger Park. Apart from the fact temperatures reach 35degrees by 11am, it’s also the rainy season. That means thick vegetation which makes game spotting virtually impossible – one second an elephant can be standing right next to your car, the next it’s invisible, blended perfectly into the bush. Still, we figured we didn’t move to South Africa to spend all our time in Joburg traffic, so headed north for four days last weekend to get away from the city and spend some time in one of my favourite places in the world. Kruger really is a remarkable place – two million hectares of Africa which has been preserved as wild as possible for the last century or so, except for the criss-crossed dirt and tar roads which allow families to traverse its entirety in nothing more rugged than a regular sedan. And what we lacked for in quantity of game spotted this time round, we certainly made up for in quality. Despite hours without seeing as much as a bunny rabbit in the road, we saw lion (twice), leopard (twice), two or possibly three herd of elephant, white rhino (including a large and relatively rare herd of six), hippo and – my personal favourite – several giraffe. Some great photo ops which will be uploaded shortly. Also, lots of young animals which had clearly been born in the spring. We didn’t see any cheetah this time round, but we did see the lady (I think) pictured above. 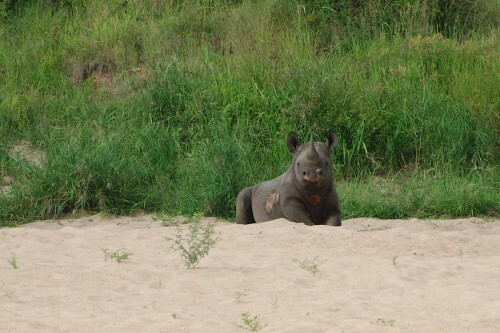 One of the most sadly rare sights in all of Africa – the black rhino. Hunted by poachers for its horn, there’s something like two and half thousand left across the whole continent, and one subspecies was declared extinct last year. Sadly, this girl had been in a fairly dreadful fight the night before by the looks of it, which is probably why we managed to catch sight of her resting (a fairly spectacular spot by Tamsin through undergrowth to the far side of a river bed as we were leaving the park. The wounds look like they came from a natural source – and there was a battered pride of lions lying in the road nearby who may well have been the cause of the gouge on her neck, the scratches on her side, and the loss of her tail. A ranger we spoke to about her was concerned that the fact her tail was missing might indicate poachers, but even my untrained eye can tell that they don’t look like man made injuries. Just vicious old nature at work. Apparently this year has seen a sharp rise in rhinos killed for their horns, as it remains popular as a medicine in certain sections of Asian societies. In South Africa alone, nearly 700 rhino have been hunted and killed illegally from a total population of less than 20,000 during 2012, more than double the number poached in 2010. That’s despite a massive effort on behalf of SA National Parks and the like to clamp down on the practice, and a high profile arrest and trial last month. As you can see from the photo above, life is hard enough for these guys as it is. Let’s hope the youngster below doesn’t end up the same way.